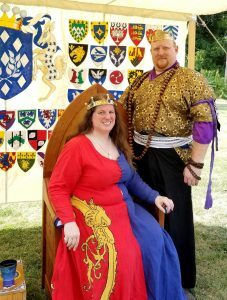 The Daimyo and Baronessa of Shattered Crystal are pleased to announce that at the upcoming baronial Twelfth Night festivity on January 5th, We invite those good Gentles who wish to vie for the right to style themselves the Shattered Crystal Baronial A&S Champion or the Shattered Crystal Bardic Champion to engage in convivial competition. A&S entries are limited to no more than 3 items or one research paper, so pick your finest. Bardic performances shall not exceed 4 minutes in length, please. At least minimal documentation is encouraged, but not required. Please contact me with questions or to discuss an exception if you require one for your specific art. It is Our intent, also to hold a Baronial Court this day. We welcome your insight on good Gentles within Our lands deserving of awards. Please email your recommendations to Us before December the 20th, That we might consider them wisely. Feast will be potluck. Details will be forth coming. Fighting will go on til no one can go on or we get bored.